In the blender, add all of the ingredients and blend until you reach a thick and smooth consistency. Pour the mixture into dessert cups and refrigerate until ready to serve. You can decorate the pudding with pineapple slices and mint leaves, or accompany with cookies. This pudding recipe can be used as a base for preparing frozen paletas or popsicles. Just pour the mixture into popsicle molds and freeze. Kids will love it! Avocado is one of my favorite fruits. Yes! Avocado is a fruit and can be used as an ingredient in sweet recipes, such as smoothies and desserts. 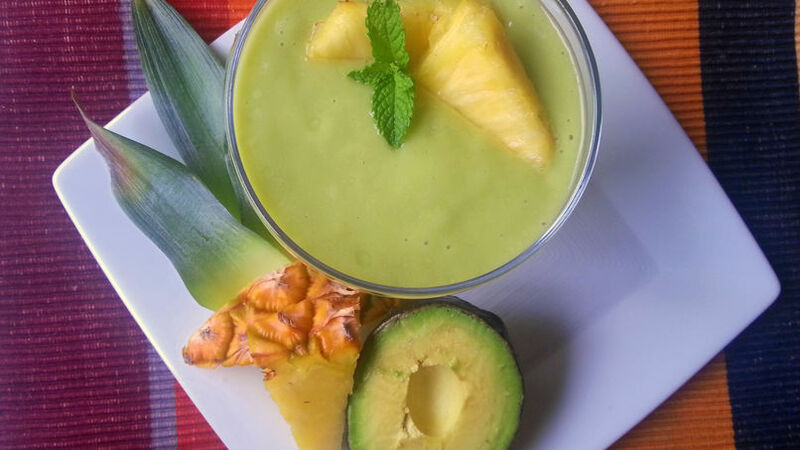 I’ve found that the combination of avocado, pineapple and coconut flavors make an exquisito trio; that’s why I would like to share this original pudding recipe with you today, using these delicious ingredients. Let’s get cooking!